The Sketchpad Reference Center is your entry point for all the details, help, hints, and advanced information about using Sketchpad. It contains a definitive description of every Sketchpad tool and command. Consult it to learn more about a particular software function or to deepen your understanding of how Sketchpad can help you pursue, discover, and enjoy mathematics. If you're just starting with Sketchpad, the Sketchpad Learning Center is your starting point as you first learn to use Sketchpad. Choose Help | Learning Center for an overview of the extensive resources available, or choose one of the following commands for a more detailed view of particular resources. Help | Welcome Videos include an overview from teachers and students who use Sketchpad, a big-picture look at the ideas behind the program, and a summary of what's new in Sketchpad 5. Help | Using Sketchpad gives you access to interactive tutorials that make it easy for you to begin using the program, a collection of 70 Sketchpad Tips (in comic and video form) containing just the nuggets you need to accomplish many Sketchpad tasks, and an online Resource Center with a wealth of detailed information. Help | Teaching with Sketchpad has a video of teachers and students describing in depth how to use the program in the classroom, articles describing effective strategies and activities at various age levels and content areas, and a set of sample activities. 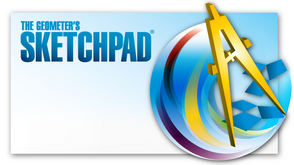 The Geometer’s Sketchpad® is a software system for creating, exploring, and analyzing a wide range of mathematics. Using Sketchpad’s Dynamic Geometry®, you can construct interactive mathematical models ranging from basic investigations about shape and number to advanced, animated illustrations of complex systems. If you’re a student, Sketchpad can help you explore not only the topics from your geometry course, but mathematical ideas in algebra, trigonometry, calculus, and other areas. If you’re a teacher, Sketchpad provides a compelling environment with which to present mathematical concepts, model classroom questions, and encourage student conjecturing, whether in a hands-on computer lab or on a demonstration screen before an entire class. Researchers and other mathematics enthusiasts use Sketchpad to help pose “what if?” thought experiments, to help probe properties of constructions, and to help discover new results — as well as to create high-quality mathematical illustrations for use in activities and assignments, reports and publications, or simply for their intrinsic visual appeal.